Industrial wind turbines near your home? Ohio setbacks will change SIGNIFICANTLY without your immediate help! Here they come again, and this time it looks like they might win. Ohio Republican Senator Dolan and others are coming for your property rights! Current setbacks are about 1,300 ft. from your property line. They are set to be reduced to about 550 ft. or 1.2x the height of the neighboring turbine. All of this legislation will happen through SB238, HB114, or an amendment to one or the other. It's honestly hard to keep up as they keep playing a shell game to make it confusing for us while they posture for the best chance of ramming the legislation through. This time it looks like they have the votes to get it done. More and more senators and representatives are falling in line with Big Wind and lining up against you and I. PLEASE MAKE YOUR CALLS AS SOON AS POSSIBLE! ASK YOUR FRIENDS AND FAMILY MEMBERS TO MAKE CALLS. FORWARD THIS EMAIL TO ALL YOUR LOCAL CONTACTS. THE SENATE NEEDS TO HEAR US. Logan County Commissioners deny PILOT to Everpower! DO NOT GRANT THE PILOT! It's a bad deal for Logan County! See for yourself using these spreadsheets that were developed using data from the Ohio Department of Taxation & the Public Utilities Commission of Ohio. Download the the Logan County No PILOT/PILOT Spreadsheet to see just how much tax revenue will be lost with the PILOT and also download the Government Subsidy Spreadsheet to see how much subsidies wind projects receive. Spreadsheets courtesy of Tom Stacy. Download our latest flyer to give to friends, neighbors, and family by clicking here. Several large scale wind projects [OVER 400 TURBINES] are well under development in Hardin & Logan Counties. Everpower Wind Holdings is slated to build the Scioto Ridge Wind Project, Invenergy, LLC. has been approved to build the Hardin Wind Farm and Juwi Wind, LLC. has been approved for Hog Creek I & Hog Creek II wind projects. Please take a moment to read through our site and educate yourself and your neighbors on the facts of the project. 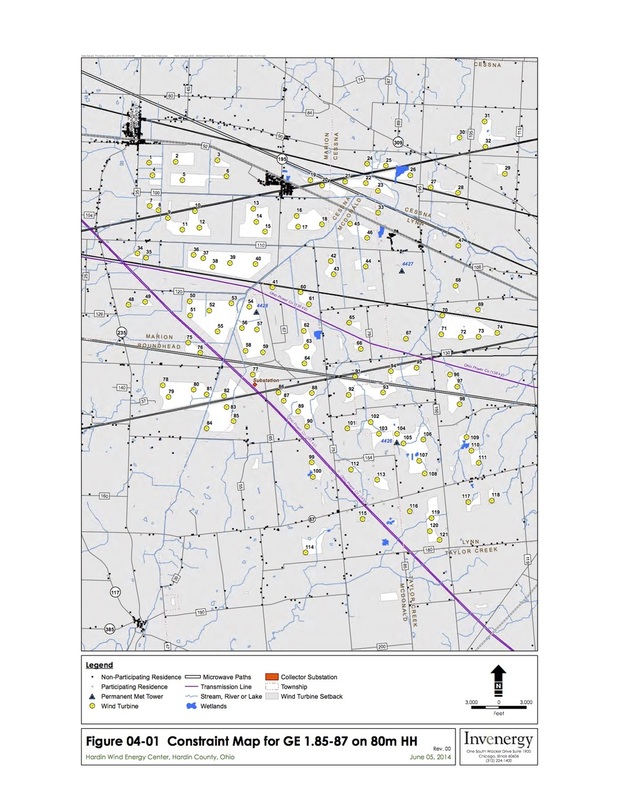 Below are maps that have been filed by the Wind Developer with the Ohio Siting Board for the Scioto Ridge Project The black dots indicate the location of a wind turbine, yellow lines are access roads, and the shaded areas represent lay down yards where construction work will occur. Click on the maps to see larger images to see if your home will be near a wind turbine. Wind projects are heavily reliant on tax dollars. While the whole tax scenario is very confusing and difficult to understand it boils down this, without tax credits, grants, and local tax abatements many of these projects would never be built. Leaseholders profit, the wind developer profits and the local taxing agencies profit, local contractors profit but do the residents profit? Check out this great explanation from saveourskyline.com as to why the wind developers are here in the first place! Opinions on the benefits as well as the downfalls of wind development vary greatly depending on which side of the argument you are on. But the facts as to who benefits from a wind project being built are hard to dispute. Obviously the wind developer is here to make money. The wind projects are a private project, no eminent domain is being used in this development. This project is between the developer and the lease owners, operating under guidelines set forth by Ohio legislators. The wind developer is here to make money. Those who have chosen to lease out a part of their land to the wind developer are set to make $8,000 - $10,000 per year, per turbine, for twenty years. Some lease owners have 10, 11, or even 13 leases. $10,000 x 13 = $130,000 x 20 years = $2.6 million dollars! While we may not agree with the project, it is hard to blame a person for taking advantage of the leases. A wind turbine lease also can increase farm land property values while driving down non-participating land values. There are many different scenarios that can play out on how taxes will be paid to the local taxing authorities. There is the PILOT (payment in lieu of taxes) program, the Alternative Energy Zones, and so on. The county commissioners are the ones who ultimately set the framework on how taxes will be levied, collected, and spent. The construction phase of the turbines will undoubtedly have a positive effect on the local economies, even if it is a temporary one. Construction crews will eat locally, buy fuel, supplies, tools and etc… Local subcontractors may be hired for some of the work. Each wind turbine takes tons (literally) of concrete, stone, and rebar to build. This does not include all of the material and labor needed to build the access roads and then rebuild the local roads after the construction phase has destroyed them. Sadly Ohio has put the bulk of the power in the Ohio Power Siting Board. Worse yet, Ohio Legislature doesn't really give the Ohio Power Siting Board the power to deny applications for wind project. What it does do is lay out the rules that the wind developer must follow, as long as they follow the rules then the project gets the green light. As citizens there are a handful of things we can do to fight the process. 1. Call and write your county commissioners. Hardin County Commissioners Ron Wyss, Ed Elliot, and Jerry Cross designated the County as an Alternative Energy Zone back in 2010. This essential rolled out the red carpet for wind developers. Wind developers are encouraged to develop projects in Hardin County. In addition, the commissioners enacted the PILOT program. PILOT stands for Payment in Lieu of Taxes. Meaning that the wind developer does not have to pay standard industrial property taxes to the county. Instead they get to make an annual payment. This payment is much, much, much less that what they would pay if the AEZ and PILOT was not in place. The AEZ also automatically gives tax breaks to each and every wind developer that wants to come to the county without further action from the commissioners. Only one of these commissioners is still in office. It is important to contact them and demand that the AEZ be repealed and the PILOT scrapped. Wind developers rely on tax breaks to be profitable. Without the tax breaks they may not build here. As of January, 2014 - Logan County Commissioners have not given any special tax treatment to the wind developer. It is important that they DO NOT. Contact them today and demand that they do not give nay tax breaks to any wind developers. 2. Call and write your state legislators. The reason why wind developers are trying to build these projects all over Ohio is because of an energy mandate passed years ago. The mandate states that Ohio must generate 25% of our electricity from renewable resources by 2025. Of the 25%, half of it (12.5%) must come from within the state of Ohio. Since wind energy does not make sense in our state because there is not enough wind to be profitable and the population is too dense (turbines cannot be safely setback), the wind developers rely on tax abatements and tax credits to make their money. The law needs changed and the only people who can change it are the legislators. Contact them today! These projects have a bad habit of creeping in quietly before anyone figures in out. Before you know it they have already started construction and your life has been turned upside down. Educate your neighbors today! 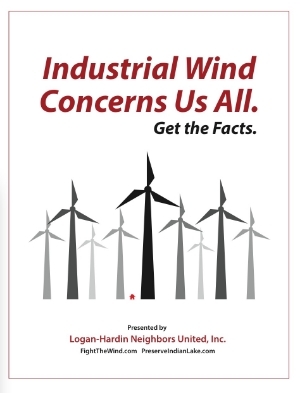 Take a moment to download this helpful and educational booklet from Logan-Hardin Neighbors United.